Get our new Go Green Bag Today. Free at our Clinic! Details Below. 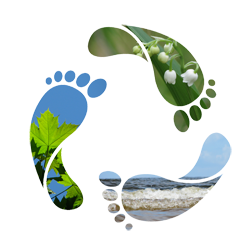 Although your feet are at the 'top' of our list to save, our future and our earth are important to us as well. Global warming, pollution and the depletion of our natural resources are just some of the many threats to our environment and our future. In an effort to do our part for a better tomorrow the Advanced Footcare Clinic is launching a 'Go Green' campaign. Dr. Vail says, "We only have one earth to live on and the future of our children depends on each and every one of us doing our part to make a difference. Every little bit helps and collectively we can make a big impact so that future generations have a chance to enjoy the world around us as we do today." Recycling print cartridges thru a local resource. Acquiring eco-friendly products such as Dr. Comfort® socks made with a renewable resource-bamboo fibers or Dr. Vail's new line of foot creams called 'Step Soothers' made with only natural and renewable ingredients from farms in Southern California. Our newest effort is our 'Go Green' recyclable bags. These fabric bags are made from 80% recycled PET products and are a great alternative to paper and plastic bags when shopping for groceries or at the mall. Some of our patients have found they make a great baby bag! Whatever you use them for just stop into our office and ask the front desk for a 'Go Green' bag. There FREE so please take that first step in saving our environment and get your bag today!